Click here to read Tico Times’ article about McKee-Jacó (will open in a new window). Asociación Pro Bienestar Animal is a member of The McKee Project in Costa Rica. Our group (McKee Jacó) began back in June 2003 to help our community address the issue of the countless stray animals roaming the streets, as well as offer help with animal health care and adoption. In spite of the economic problems and lack of volunteers, we are able to spay/neuter more than 1000 animals per year, both stray and from low income families, as well as treat and find homes for over 500 dogs and cats each year. McKee Jacó also helps with other medical services (treatment of mange, ehrlichia, recuperation after accidents, etc) and offers economic help when necessary. McKee Jacó is a non-profit organization which operates with no outside help of any kind. It survives thanks to the support of all the individuals who wish to help stray animals and animals belonging to people who simply cannot afford to take proper care of them. Effectively eliminating the numbers of unwanted and abandoned animals through Aggressive Companion Animal Population Control Campaigns (McKee uses surgical techniques: spay/neuter, until a safe and sure pharmaceutical method is available). Basic medical care through the McKee Associate Veterinary Network: vaccines, nutrition support, and critical emergency care. Education and Participation of Communities: Making responsible and responsive communities — Education & Participation — Everyone has a role. Replacing shelter “solutions”, by constructing better Companion Animal Homes: Building responsible owners & good homes through education in schools and McKee Community Centers. These components are done hand in hand, through in-place networks. The solutions are easy & cheap, and are delivered community by community, throughout the country. The McKee Project is a comprehensive, cost efficient, socially responsible and humane solution for street animals. It is ambitious and innovative in its approach. Its goal is to relieve pain and suffering through a national spay and neuter program, while simultaneously creating responsible owners and responsive communities through education. 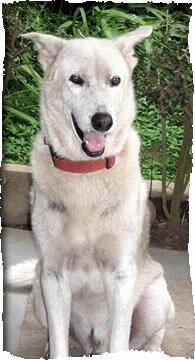 The companion animals are kept in their communities. Latin America doesn’t have the resources for shelters. And pets will not lead better lives if communities are not part of the solution. Community education on pet care is essential. In Costa Rica, the Costa Rican Veterinary Licensing Board & Association (CMV- Colegio), has incorporated the McKee Project into its operating programs. The Colegio has taken McKee to the Costa Rican people in the form of community veterinarian participation (donated spay and neuter procedures), and works to obtain municipal donations of land for animal centers (combined centers of animal care / community awareness / education / adoption), and provides materials for school educational programs. In a humane way, the mutual goal is to control and prevent an increase in the hundreds of thousands of street animals, and give each animal a better home in the community. 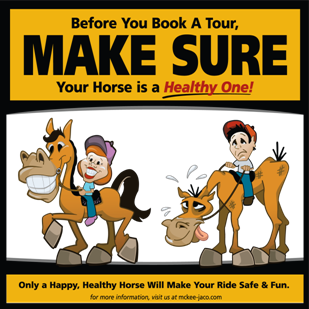 Before you book a tour, make sure the horse is a Healthy One!